One thing that I meant to include in my 'Shake, rattle and roll' post from my visit to the doctors on Tuesday was a discussion that we had concerning prescription prices. I don't know how it works in America or anywhere else, but in the UK, the prescription prices have risen to a whopping £7.65. Now, since I am on a humongous amount of painkillers and now antidepressant's, the costs are really stacking up. They have been since February but with it now coming up to Christmas and me only being on ESA, I am beginning to struggle with it. When I went to the doctors on Tuesday I had 3 prescriptions, then on top of this had to get more Paracetamol and Ibuprofen. In total it came to around £25.00 which is a lot of money when you have very limited funds. When the doctor gave me these prescriptions I asked him if there was any help I could get with paying for them as all I could see on the internet previously was that you get free prescriptions if you are on Jobseekers (actively seeking work) but not if you are on Employment and Support Allowance (for long term sick) - which to me makes very little sense. Surely you should be able to get help when you most need it? A friend had told me that she had once been given an exemption certificate from the doctors which entitled her to 5 years worth of free prescriptions, but, when I mentioned this to the doctor he seemed completely dumbfounded. He said the only type of exemption certificate he knew about was for long term health problems such as diabetes or heart problems. Surely endometriosis falls under this same band? Nope, apparently not. His best advice was that I could purchase a prescription payment certificate (PPC) from the chemist where you buy up front and this saves you money. :: A three monthly PPC is £29.10. This saves you money if you need four or more items in three months. 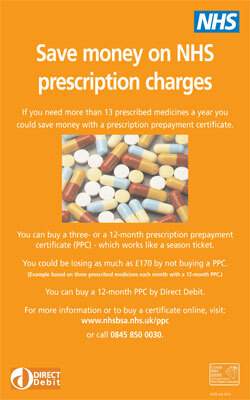 :: A 12 month certificate is £104.00 and saves money if 15 or more items are needed in 12 months. To apply for an HC2 certificate, you should complete form HC1, which is available from Jobcentre Plus offices or most NHS hospitals. Your doctor, dentist or optician may be able to give you one, too. So, after all the information I have previously read and been told by the doctor, it does indeed look like I can get some help. I just felt so cheeky for asking and then for him to turn around and say that exemption certificates are only for long term health problems felt like a real kick in the teeth. Does having this disease from the age of 12 and possibly way past the menopause not qualify as long term, when someone that could have just been diagnosed with diabetes this year is? Has anyone had any experience with this issue or been in the same position? Any advice would be hugely appreciated. I'm fed up of people looking at me like I'm scrounging when I have very little money and I'm struggling to afford the medication I need. I think it's shocking you all have to pay for prescriptions in England, it's free up in Scotland! It s really shocking especially as Endometriosis can kill you in the worst cases. I am 38 and have had to have a hysterectomy to help my Endometriosis however even though I have to be on HRT to prevent brittle bone disease and Tramadol for the pain that I am still in as they found Endo in my hip I still cannot get free prescriptions and I am too like you on a low wage and struggling to pay the 12 month PPC ;( .... So yes I really do sympathise with you!